Great for use in Spain/Portugal - discount available on quantites of 5, 10 and more - please email for details! 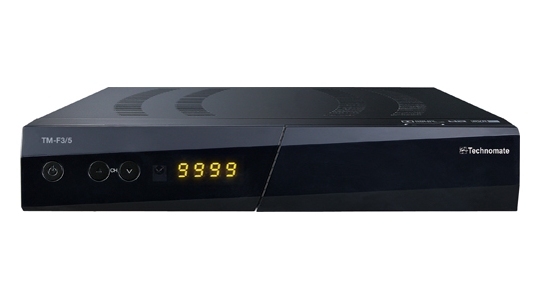 The Technomate TMF3/5 is superb high definition PVR ready satellite receiver sporting one embedded multicrypt card reader. With piano black finish TM-F3/5, you can now watch channels in glorious High-Definition (HD), Full HD 1080p with Dolby Digital Plus to give you a superior audio experience. It’s also 3D ready. Not leaving the Standard Definition (SD) channels behind, we’ve developed a built-in hardware Upscaler to improve the picture quality of Standard Definition (SD) channels via the HDMI output. You can use a USB Hard Disk Drive (HDD) to record all your favourite channels, listen to your music and watch a slideshow of your photos. What’s more, you can record up to 3 channels (on the same transponder) whilst watching a file from your USB HDD. You can even watch the .avi and .mkv file formats. The Ethernet port allows you to connect to YouTube, check your local weather, view maps and listen to online radio. Instead of connecting your Satellite Receiver to a PC by an RS-232 cable to download software, you can now download software at lightning speeds, taking only seconds compared to minutes by RS-232 on your PC. You can also download channel lists by USB and also upload them as a backup. The satellite receiver has a channel memory of 10,000 channels therefore you will never run out of space to store your TV & Radio channels. For searching, there’s a hardware blind search tuner which is much more accurate than software blind search. The satellite tuner is super sensitive to pick up weak signals and weak transponders. To watch the same channel on another TV, there’s an RF modulator at the rear of the satellite receiver, so you can watch all your channels in your bedroom (requires a cable to be connected from the RF modulator to the second TV). It’s even Eco-friendly with 1W standby power consumption. Click the button below to add the Technomate TM-F3/5 High Definition Satellite Receiver to your wish list.